Chuanxing Zeng (b. 1974, China) Born in Longchang County, Sichuan province, a minority region of China. Zeng’s work is influenced by the environment in which he was brought up, as well as by the changing cultural dynamic of China. Graduate of The Central University for Nationalities (today Minzu University of China), with a focus on oil painting. Zeng continued developing his artistic aesthetic based on classical Realism. 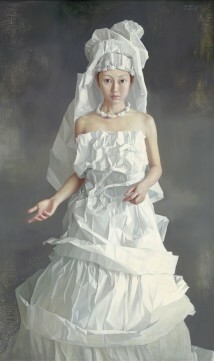 His most celebrated series, “Paper Brides”, features figures wrapped in paper fabric of red and white, as a symbol to Chinese and Western tradition respectively. The delicate fabric serves as a representation of the instability of marriage in 21st century China. His work can be found in both public and private collections around the world.